Almost every house or office has a variety of electrical plates. The market is filled with a wide range of electrical plates. Each plate has a specific purpose. An average homeowner should have a basic understanding of how each of these devices can serve your needs. 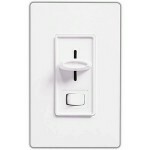 In a majority of cases, wall switch and wall dimmer replacement is quite easy to install. Light dimmers have gained great popularity over the past decades. Thanks to the extensive energy saving features of wall dimmers, the light dimmer switches conserve the electricity. A homeowner has to pay less for energy use, saving a bundle. The wall dimmers are rather inexpensive. You can easily purchase them online from our store at WestsideWholesale.com and have your order delivered fast and free. Besides excellent energy saving features, light dimmers are able to create a certain atmosphere of relaxation and contentment. The wall dimmers in particular are able to adjust the level of lighting brightness. As a result, a regular light switch that is only capable of turning the lights on and off, can be easily replaced with effective wall dimmer. Shut the power off, using the circuit breaker. Proceed with existing light fixture removal. Extract 2 basic screws. It is best done with a Philips head screwdriver and put the screws to a safe place. The light fixture is removed with the help of extracting the two mounting screws. They hold the metal wall box inside. Also, on the top and below part of the light switch assembly, there is a screw. Extract and save it as well. Then pull the light switch assembly; use gentle moves. Move it to one side in order to expose the electrical wires. Keep them connected to the switch. Write down which wire is connected to which terminal. Disconnect old wires from wiring post. Proceed with attachment of the wires to the light dimmer posts. Insert the wall dimmer into the metal wall box assembly. Remove the dimmer control knob. A customer can handle wall dimmer installation with basic DIY capabilities. The wall dimmer handling and installation are very similar to traditional electrical plate’s installation. We have to warn you that working with electrical outlets is not safe. That is why you should do all necessary precaution measures to keep yourself safe and happy. So, if you have an experience of handling the electrical outlet in the past, you will easily install a newly purchased wall dimmer at your house. 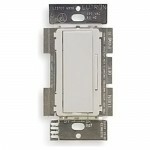 About Lutron Wall dimmers. 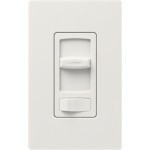 Lutron is the leader in the lighting control industry and the first to successfully mass-market the wall dimmer. It is still the only company to create systems of wall dimmers, and for over 50 years has been manufacturing innovation. 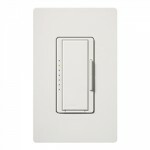 Lutron Wall dimmer Switches provide a simple and elegant way to control lighting in any space. When it comes to Lutron Wall dimmer Switches, you will have your choice from hundreds of different design options and features such as the Diva, Lyneo, Maestro, Abella, Ceana, Nova T, Nova, Vareo, and Vierti in designer, traditional, architectural, and new architectural styles. Westside Wholesale provides a variety of wall mounted Lutron Wall dimmer switches that will dim Incandescent, Halogen, Magnetic low-voltage, Electronic low-voltage, CFL, Neon or LED wall dimmers. 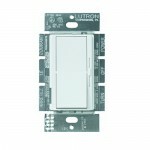 Lutron Wall dimmer Switches are available with voltages of 120V, 12V and wattages of 300W, 450W, 480W, 600W, 800W and 1000W. Select Lutron Wall dimmer Switches feature LED lights that show the preset light level while giving off a soft night-light like glow. 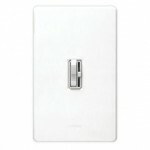 Wall mounted Lutron Wall dimmer Switches offer convenience, style, security, as well as conserve energy while beautifying your home. A Lutron Wall dimmer Switch will reduce electricity usage and extend the life of the bulb. 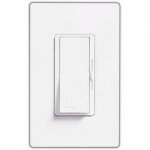 All Lutron Wall dimmer Switches automatically save 4-9% in electricity, and installing a Lutron Wall dimmer is one of the easiest ways to go green in your home and office. A standard light switch will only save electricity when turned off, whereas Lutron Wall dimmer Switches save energy 24 hours a day, 7 days a week. All lighting will use less energy when dimmed, and an eco-friendly Lutron Wall dimmer Switch will provide a great way to save energy while saving money. 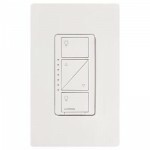 Most Lutron Wall dimmers are available with the eco-dim feature, which guarantees at least 15% of energy savings compared to a standard switch. 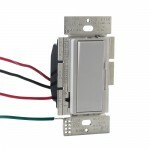 Available now are the new wall mounted wall dimmer switches for Dimmable CFL and LED Bulbs. 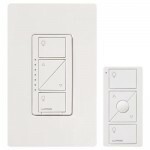 These Lutron wall dimmer switches Incorporate HED technology to improve dimming performance compared to standard wall dimmers. Dimming CFLs and LEDs offer even more energy savings. Whether it’s a home or commercial building, Lutron CFL and LED wall dimmer switches are a great alternative to incandescent or halogen lights bulbs. Lutron Wall dimmer switches will take your lighting needs from day to night, by allowing you to create a personalized comfortable setting in your home or office.